When your company, group, or organization needs custom stickers, custom labels, or decals, Good Guys Signs is the right place to trust. 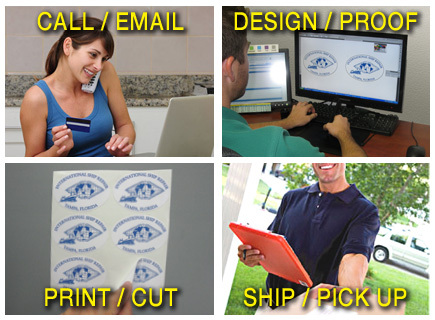 We print tens of thousands of custom decals every week, from small quantities to 1000’s at a time. If you need a decal with a custom shape, a sticker with a special adhesive, a label with a specialty overlaminate, you really should try us first. We are short and medium run specialists, and print digitally at 1440 DPI x 1440 DPI. Stunning quality, low prices, fast service. Vinyl has 4 Year outdoor durability, printed with eco-solvent ink. Made by 3M, extended outdoor durability, can conform to curves. Many to choose from, depending on the complexity of the curve. Great look on everything from glass to dark materials, head turner. The standard in most decals, gives a polished, professional look. Any shape can be achieved with our state of the art Graphtec cutter. Combining cut and printed vinyl opens the door to unique designs. Need to remove a decal/sticker easily? This is the product to use. This super strong adhesive is great for hard to stick surfaces and low energy plastics. Best vinyl for overhead fluorescent lights, readable with no glare. Easy on and off windows, white ink required to make them pop! Great for Product Launches/ directional uses. Anti-slip overlaminate. The final look and feel, as well as outdoor durability and resistance to handling/moisture/sunlight, is effected by the type of overlaminate used. 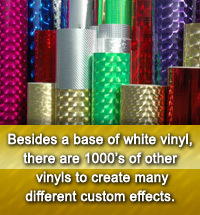 At GGS, we have a huge assortment of overlaminates. Light gloss, with most of the shine from fluorescent light removed. Makes a printed sign a Dry Erase Board! 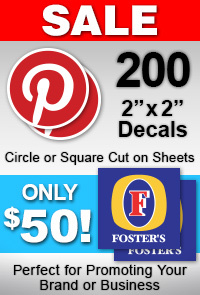 Adds value to any sign/decal. Protects graphics, extends life, and gives a bright classy shine. Used to remove all shine, used in fluorescent lighting /TV settings. Excellent resistance to chemicals and solvents. Vandal resistant. Frost, Glitter, Diamond Plate, Carbon Fiber, Metallic textures.